This hike begins off Forest Road #115 which is just off FR #29. Be aware that this trail allows motorized bikes and the trail is V shaped as a result. On the day I hiked it I did not see or hear any bikes. This hike is one of the steepest hikes I've ever encountered. In the first mile and a half you gain almost 2000 feet. There are lots of switchbacks, about 8 major ones in the first mile. The hike is in dense young forest for the first 1.5 miles. Then you break out into the open for a brief look at the surrounding terrain. 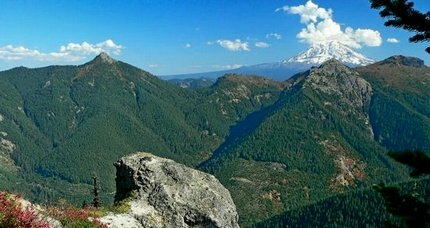 Here you get an outstanding view of Mt Rainier to the north, and of the McCoy Creek Valley below. The trail levels off at this point and soon you reach the junction of Trail #283 with #259. Bear right on Trail #259. The trail loses elevation for about a quarter mile and crosses a small stream with very muddy banks. The trail begins a slow climb from the creek around the base of McCoy Peak as it works its way to the north side of the mountain. Gradually the trail becomes steeper and steeper. Also the trail becomes more and more in the open and the views increase accordingly. At about 3 miles from the trail head the trail reaches the summit of a saddle between McCoy Peak and the uplift to the north of it. 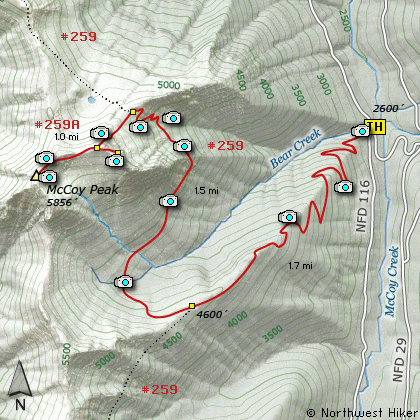 It is at that point you need to search for the obscure trail that will lead you to the top of McCoy Peak. This mile long trail will gain nearly 700 feet as it works its way up the north and northwest sides of the mountain. At times the trail is clearly visible. At times it is difficult to follow. The trail comes out on the western ridge of McCoy Peak which runs to the southwest. It is a great hike to follow this ridge line to its end where you get absolutely wonderful views of all the surrounding mountains; Mt Rainier, Mt Adams, Mt Hood, Mt St Helens and all the other less prominent peaks. In season the last 2 miles of this hike are a flower garden. To reach the actual legitimate summit of McCoy Peak, follow the ridge back to where the trail leveled out and look to the east northeast. The bare rocky summit is clearly visible and just a short walk away. Again, you are rewarded for your efforts. The V shape of much of this trail may lead you to be more exhausted that you might expect from such a climb. In my opinion it is still worth it. Travel east on US Hwy 12 for about 48 miles to Randle. From Randle, travel south on State Road 131, crossing the Cowlitz River and in a mile you will come to Cispus Road on your left. Bear left and follow Cispus Road, which become Forest Road 23, for another 5.2 miles and you will pass Forest Road 55 on your left. Continue on FR23 for another mile and you will pass Forest Road 083 on your left, which is the road to Layser Cave. But you keep straight ahead on FR23 for another 1.9 miles. You will then come to the junction of Forest Road 28. Turn right on FR28 and cross the Cispus River. A mile from SR23 you will come to the junction of Forest Road 29. Continue south on SR29 for another 3.7 miles and you will come to Forest Road 2904 on your left. But just keep driving south on FR29 for another 6.5 miles until you come to Forest Road 115 on your right. Bear right and follow FR115 down a steep incline and across a bridge to the trailhead for this difficult hike.